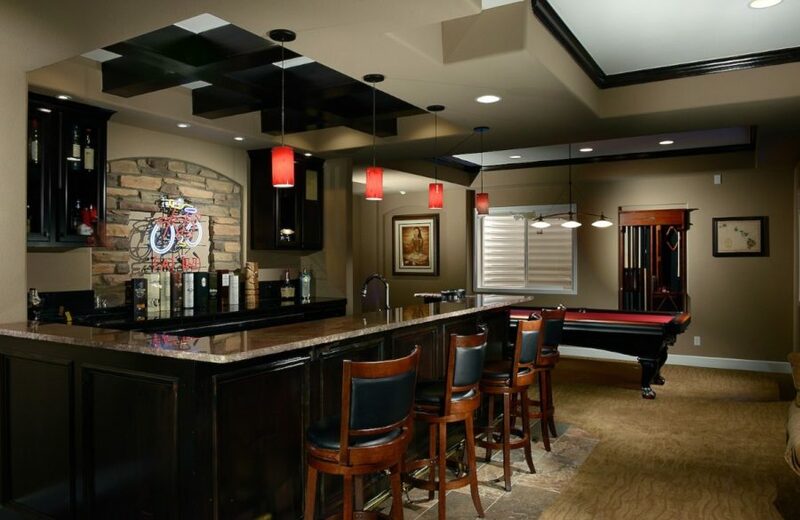 These 15 Basement Bar Ideas Are Perfect For the "Man Cave"
Is your beau creating a macho escape for himself – and the buds – down below? 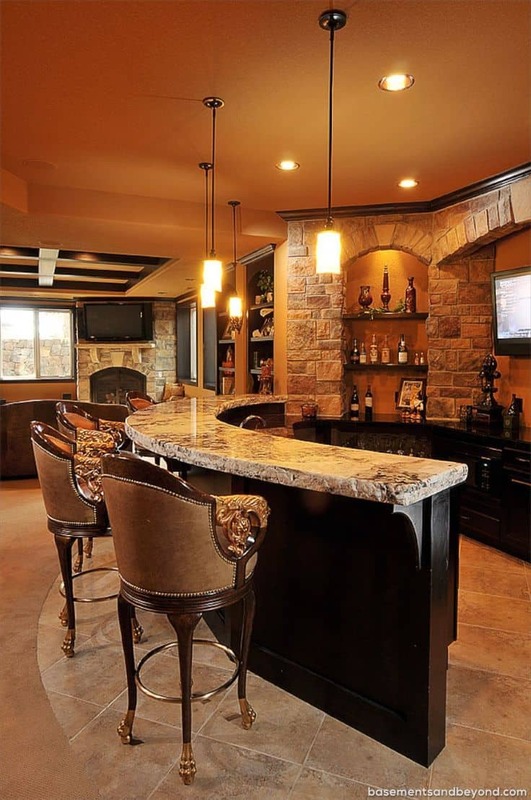 These 15 basement bar ideas are perfect for the “man cave” in your home. 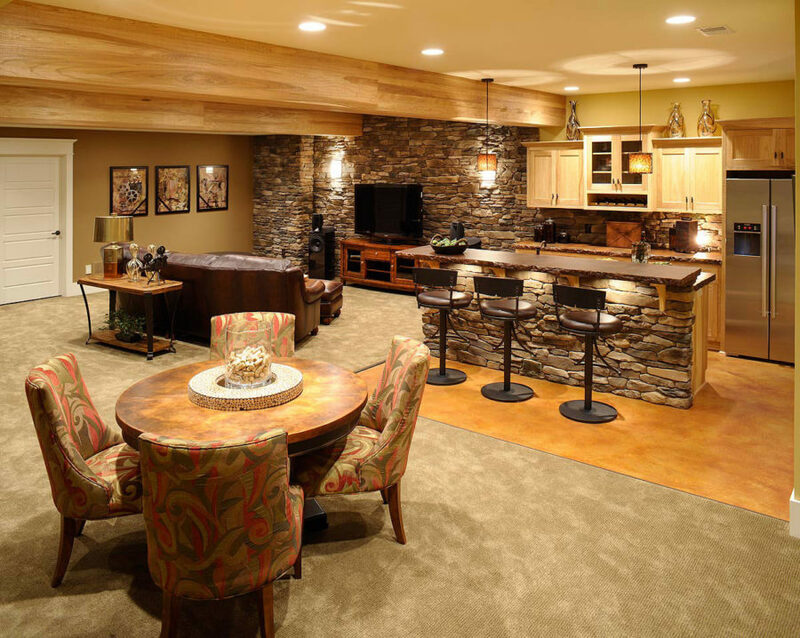 Of course, everyone will eventually get to enjoy the space when any kind of entertaining needs come to call. But for the man of the house, he’ll certainly enjoy the extra luxury that’s been added to his own space. 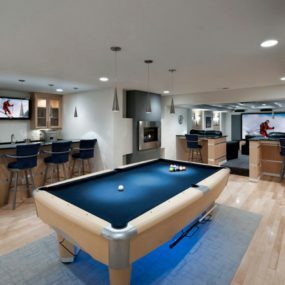 Of course, Pinterest has the best bouts of inspiration gathered from the rest of the web and they’re starting us off with this complete “man cave” design that’s full of style and cozy vibes. But let’s focus on the bar. 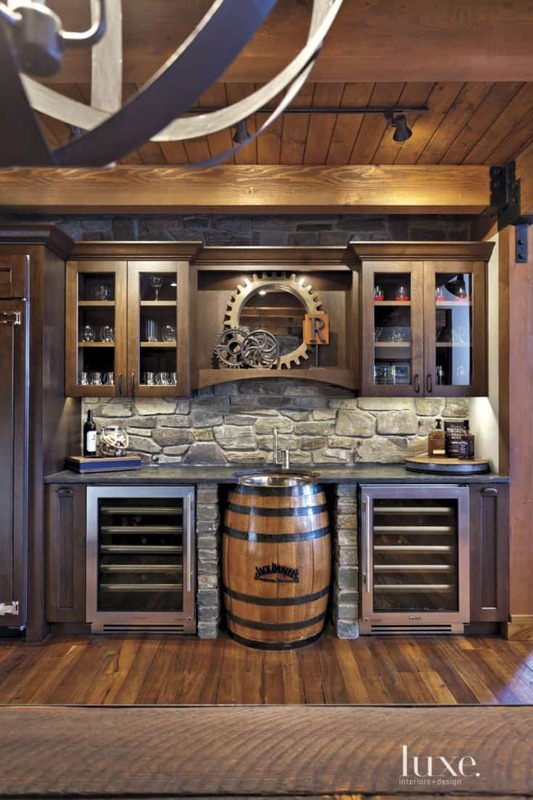 With a stone countertop, bar seats and everything you need to crack open a cold beer and build a sandwich, your beau will certainly fall in love with this idea. But maybe he’s more inspired by a vintage setup. 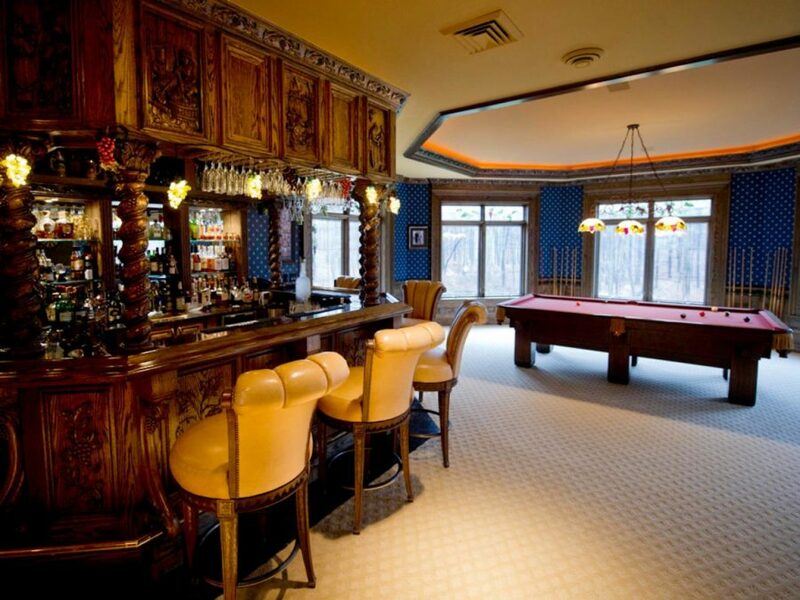 And this complete wet bar certainly has a “speakeasy” vibe that the men will be wowed by. He’ll love gathering the rest of the boys and pouring some whiskey on the rocks before the big game starts. Thanks for the inspiration HGTV! For some “garage” or industrial style vibes, you’ll want to take a deeper look into this design from Homedit. 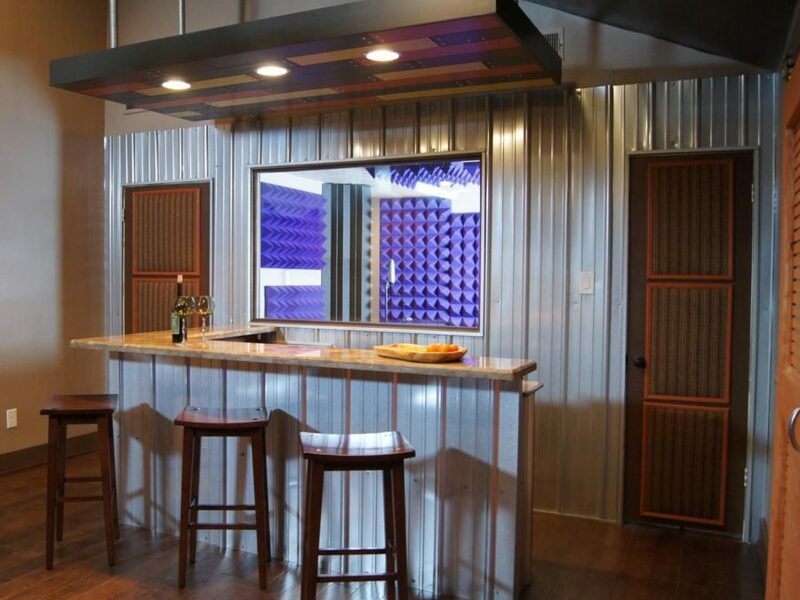 Taking metal siding and creating an important nook takes a small, basement space to an entirely new level. 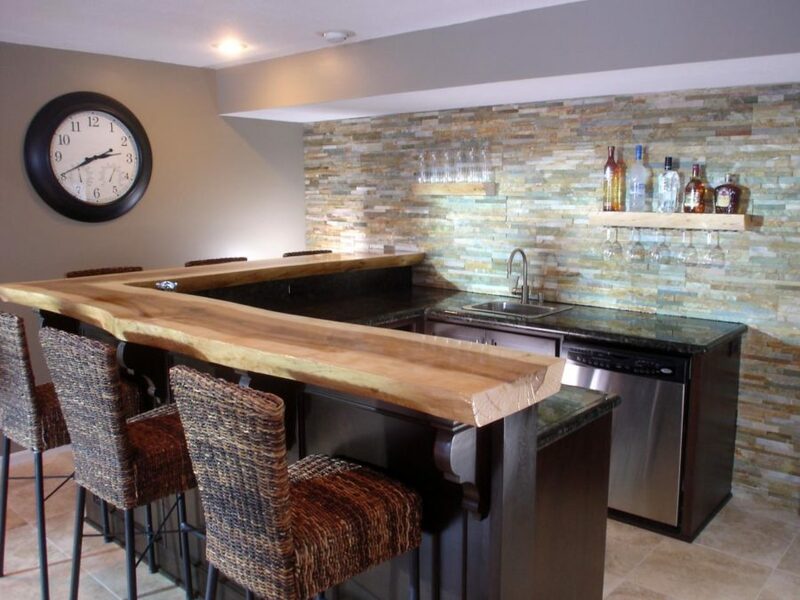 It’s a great way to personalize the basement and the bar area. 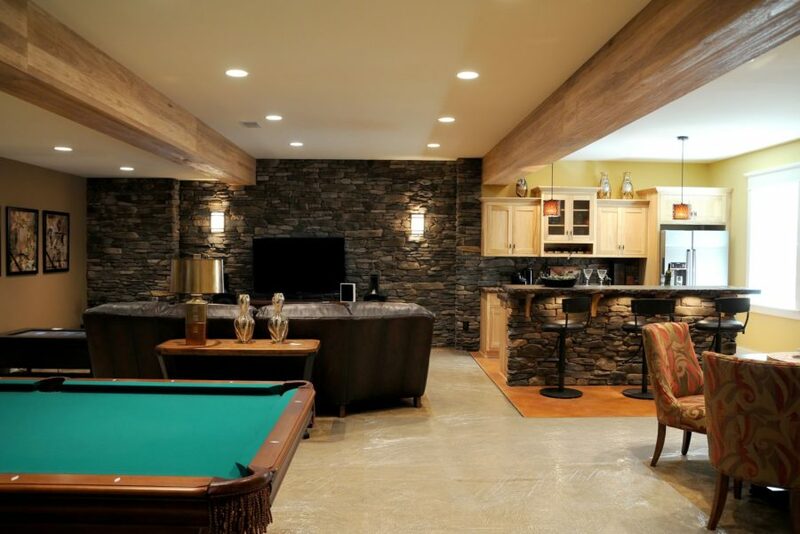 Bosh Designs gave us a simple design that anyone can easily recreate in their own basement – whether you’ve got a lot of space to work with or not. 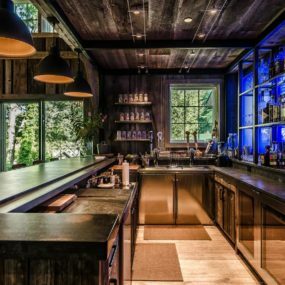 A minimal bar, some metal stools and something funky on the walls are all you need to get yourself started. Of course, you could try your hand at a DIY backsplash as well. 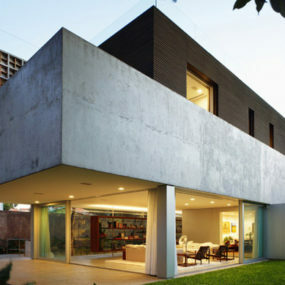 Of course, simplicity is usually best inside a family home and that’s what we have served up here by Breaking Design. Black and clean, with a stone backsplash and high-bar stools, this space is easily complimented by pops of red and bits of perusal tastes as well. 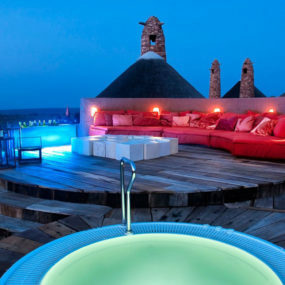 Your man will definitely love his home away from home. 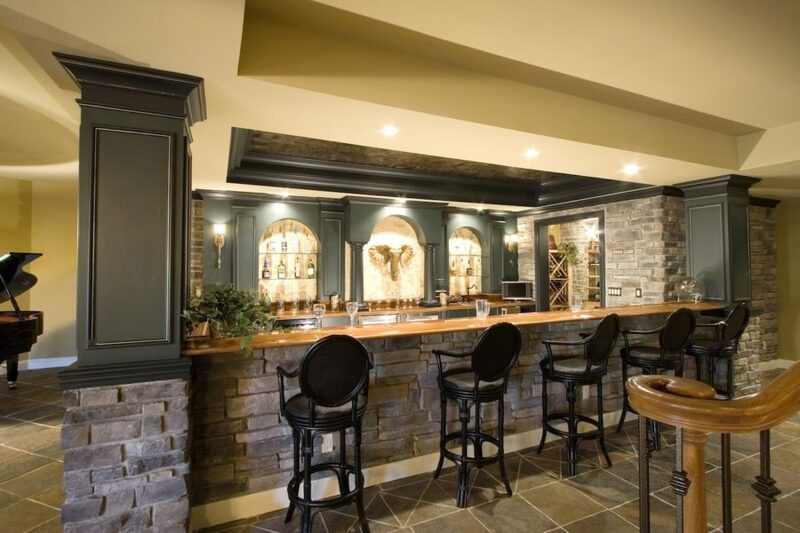 Check out this farmhouse-inspired space that we tumbled upon while scrolling through Pinterest! 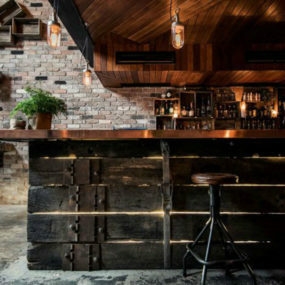 It’s been mixed nicely with a touch of industrial design as well, creating a trendier overall look. Again, you truly get everything you need in one spot to entertain and enjoy on your own. 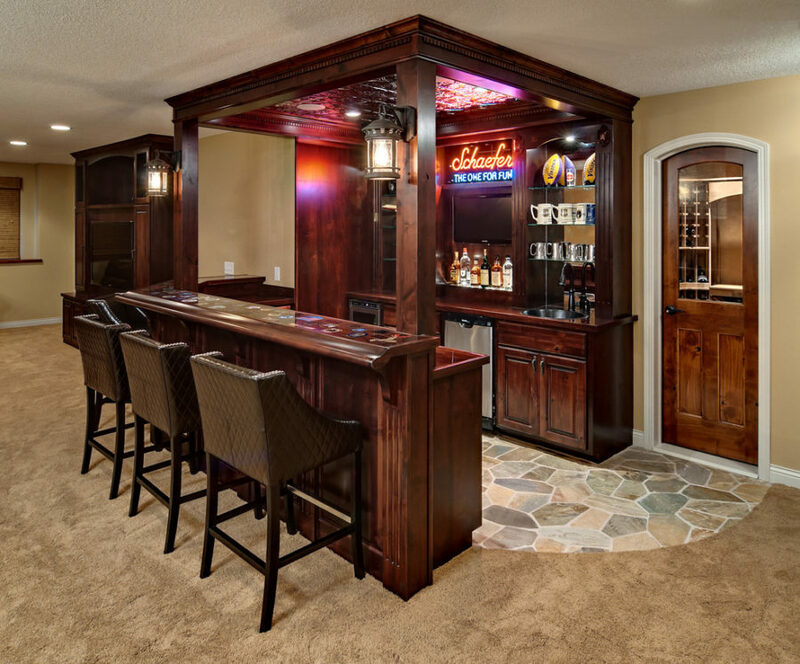 Summer Home Decor showed off a smaller, more traditional basement bar idea. And we love it too! 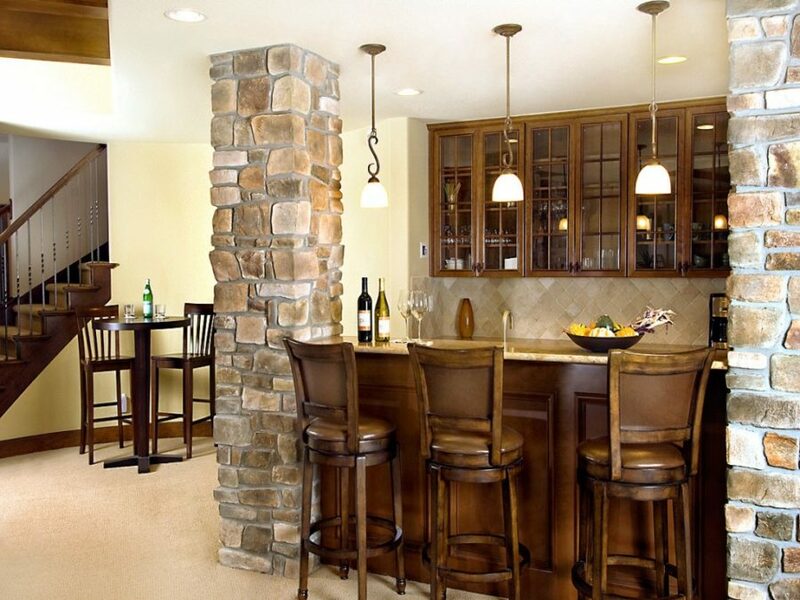 It’ll fit inside spaces that don’t have such an open feel and we love how it was sectioned off with the addition of some edgy, stone columns. And although they decided to go with darker wood cabinets, the open fronts create the illusion of more light which is a great balance. 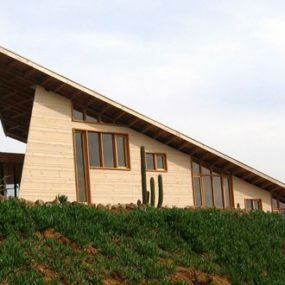 Homedit featured this one as well. 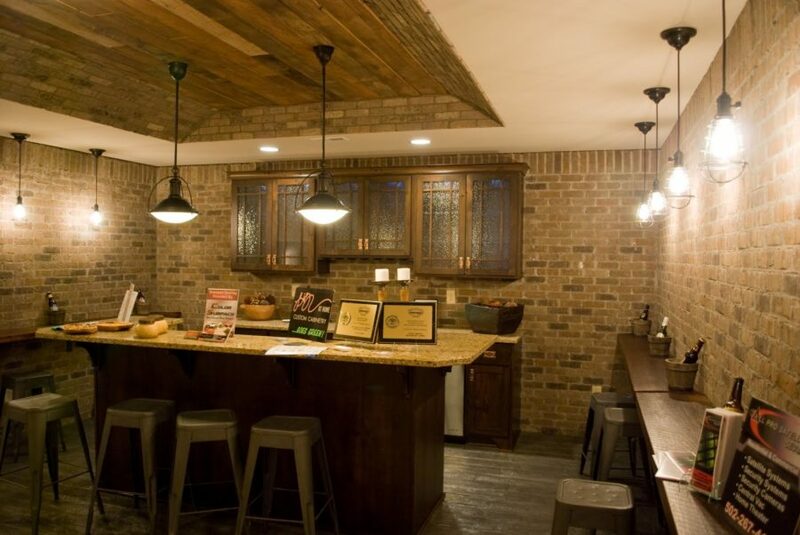 Surrounded by brick, this space has definite “pub style” vibes that we’re swooning for. The fact that you can transform a part of your home into a true escape is such a fun, creative way to decorate and revamp. 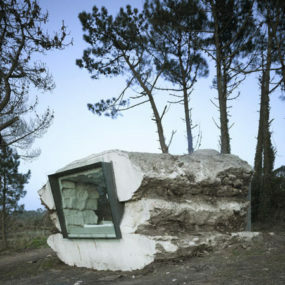 We loved curved bars as well, especially when topped with marble or granite. There’s a distinct nod to vintage style here as well giving the space an even more luxurious feel for our more sophisticated of men. Thanks to Pinterest we were able to feature this beauty to our followers as well. If you want to take a tour of a space that speaks to you, and this is the one that does, all you have to do is hop on over to YouTube. 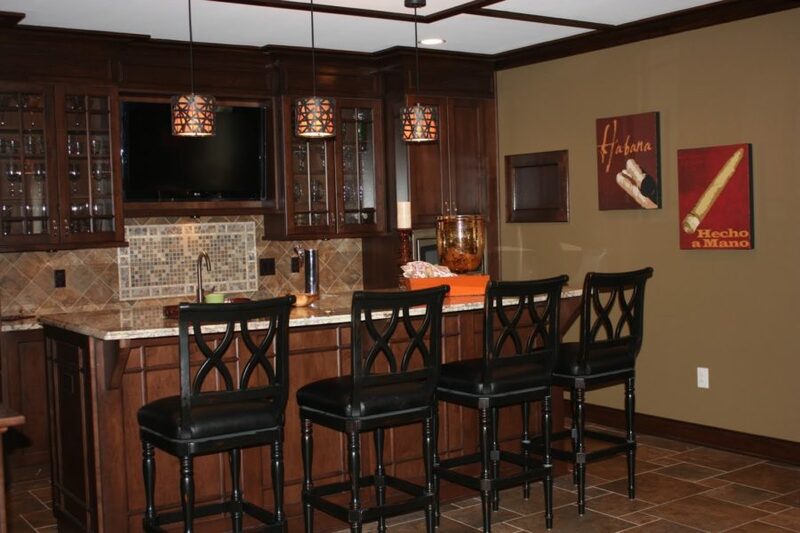 Deep, rich cabinets, complete with amble storage and a wet bar, you’ll be able to do all kinds of entertaining in this fun area. 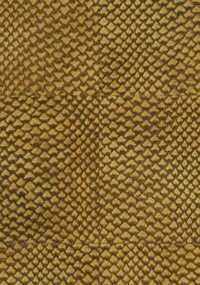 Decorate the walls to personalize it! 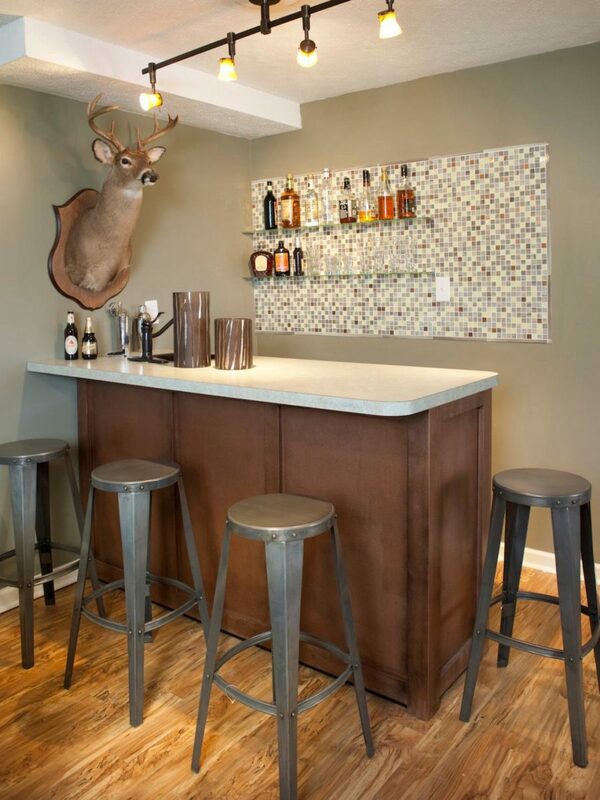 And finally, over at HGTV you’ll find this mixed textured bar that’s been highlighted by an accent wall that you can learn how to DIY! 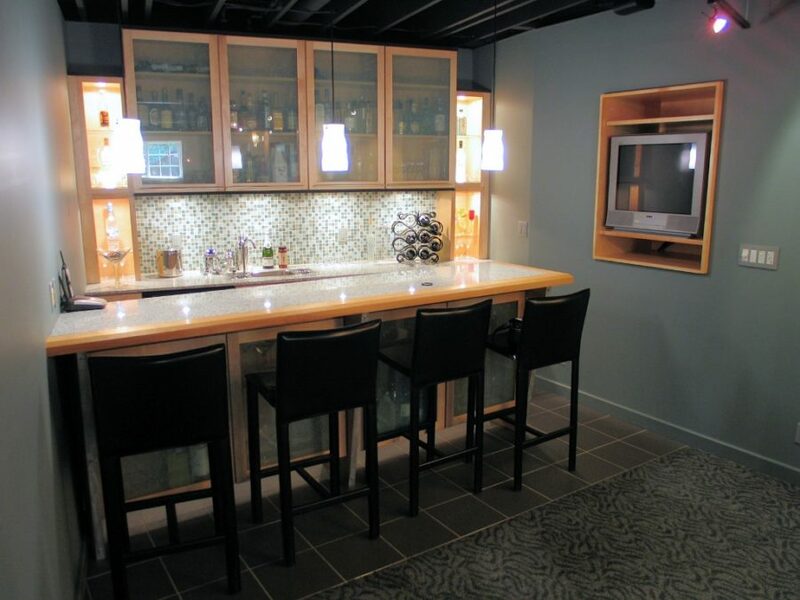 Here too you have all the function you need from a wet bar with ample opportunity to personalize and decorate to your own liking.